I am admittedly on a mission to shift the discussion in economic development from a focus on GSP and jobs to a focus on the degree to which citizens are realizing the American Dream. To paraphrase James Carville’s famous line from the 1992 Presidential campaign – “It’s Not The Economy, Stupid – It’s About The American Dream”. In my mind, the degree to which the American Dream is being realized is the most appropriate end measure of the authenticity of Brand America’s promise. And the development of strategies to ensure people living in their community realize the American Dream should be the #1 focus of conversations between local economic development professionals, elected officials and private sector leaders. Certainly measuring both GSP and job growth is important. But, they are not the only things that contribute to enabling (or disabling) people’s ability to realize the American Dream. The American Dream is more complex than that. Can You Measure The Degree To Which People Are Realizing The American Dream? A team at Xavier University in Cincinnati, Ohio has developed (and validated) a measure of the extent to which the American Dream is being realized. 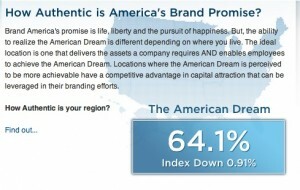 Their market research based metric is called the American Dream Index (ADCI). I am pleased to say the Burghard Group is working with the Xavier Team to introduce the ADCI to the economic development community as an important performance measure. At present, the ADCI is available only on a national and multi-state regional basis. However, consideration is being given to collect sufficient data to make the index available on both a state and major MSA level. It is reflected as a number on a 100-point scale and represents the extent to which the American Dream is being realized. 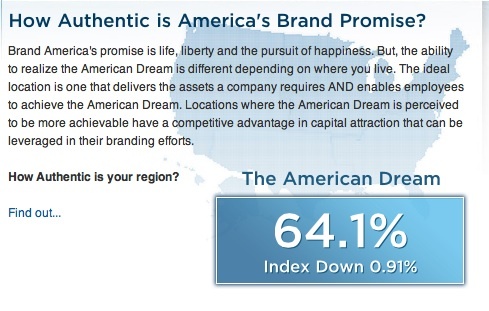 In August 2012, the national ADCI was reported as a score of 64.12 (down 0.91 points from July 2012), which in my opinion suggests the authenticity of Brand America’s promise is trending in the wrong direction and needs improvement. In Which Region Is The American Dream Being Realized The Best? Based on the data through August, the Southwest Region leads the nation in the degree to which the American Dream is being realized. How Do You Impact The ADCI Score? The ADCI is comprised of five sub-indexes (see above). It is a well-rounded and statistically validated assessment of how Americans think about the American Dream. Each sub-index is made up of several dimensions. Making improvements in performance against any of the sub-indexes can positively impact the composite score. Economic Development professionals, elected officials and private sector leaders need to better understand of how well their community scores in each of these categories and then adopt strategies that will positively impact their citizen’s perceptions. In future posts, I will be exploring the make-up of the ADCI in greater depth and providing counsel on how to develop strategic plans that will improve the ability of your community to enable its citizens to realize the American Dream. In addition, the Xavier Team authors a blog that digs deeper into the data and provides perspective on how to interpret some of the national results. The Xavier University Team publishes a monthly report highlighting key findings from the ADCI survey. In their August report, the national economic index score improved; the well-being score declined; the societal index improved; the diversity index declined; and the environmental index declined. All in all, August was a poor performance month for the authenticity of our nation’s promise. Of course, it is important to lift the hood and get underneath these sub-indexes to understand what is driving performance change. The Xavier University Team’s Monthly Report provides that level of granularity and I recommend you take a look at it – CLICK HERE. Huffington Post recently ran an article entitled “The American Dream Needs a Jumpstart”. US News ran an article suggesting America is not so exceptional anymore. Hedrick Smith, author of “Who Stole The American Dream?” wrote an interesting opinion piece offering his opinion on the question – Do You Think The American Dream Will Ever return To America?. If we want to preserve the ability to realize the American Dream for our children and grandchildren, we need to change the focus of the discussion now. We need to focus on doing those things that will enable the Dream to be achieved. The good news is the drivers of success are not hard to understand. In fact many are common sense. They simply need to be better prioritized and used to guide local decisions on asset creation, infrastructure investment and public policy reform. I will be sharing more thoughts on this in future posts. Does It Really Matter In Economic Development? If you are a company CEO looking at two potential location options for your capital investment, wouldn’t you want to select the community where people are realizing more of the American Dream. Wouldn’t you think that the ability to achieve the American Dream would correlate with increased employee happiness, increased employee longevity and increased productivity? All things that contribute positively to your Company’s bottom-line. CEOs will use the ADCI score as a way to help differentiate locations and decide which should be on the short list for due diligence. Location options in areas with low ADCI scores will be less desirable than locations with high ADCI scores. Over the balance of 2012 and into 2013, I will be publishing more about the ADCI. I also plan on hosting a few workshops to discuss the implications of the ADCI in community strategic planning and on how to use a positive ADCI score to differentiate your community from the competition. I will be attending the IEDC Conference in Houston, September 30th – October 3rd. Please make a point of having a conversation with me about the ADCI. I would love to share what I know and my thinking on how you can help to change the dialogue. In the interim, please leave a comment. I’d love to read your thoughts. Great idea. I wholly endorse this initiative! The American cultural source code for America is DREAM – from its earliest days when the pilgrims discovered and explored the ‘New World’ to putting a man on the Moon. Thus, America’s primary mission is to keep the Dream alive. It should never shut the door to exploration and discovery. The current Mars exploration programme is bang on-code. However it must respect the cultural codes of other nations by not forcing its ideology on them using military might, but by sharing its vision through Hollywood films, Silicon Valley technologies and Disneyland experiences. Brand America is uniquely the Land of the Free – the Freedom to Dream the Impossible Dream.